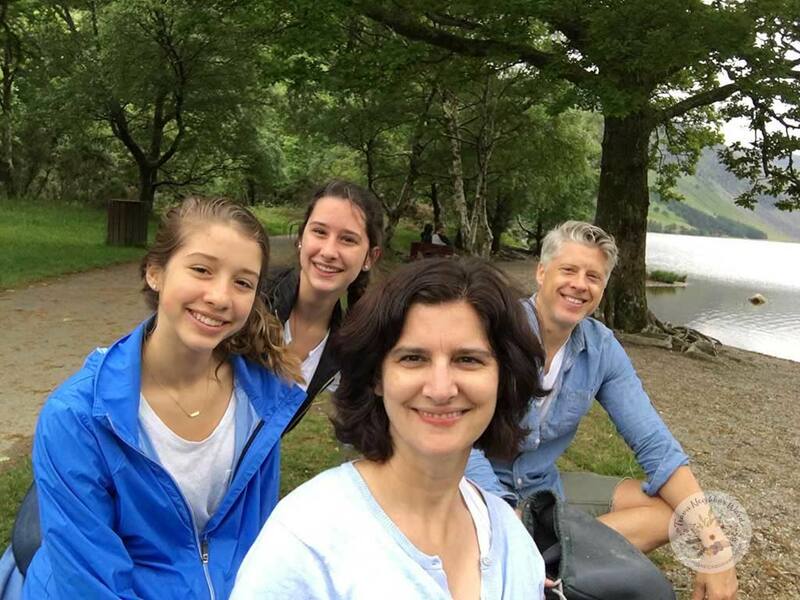 One of my family’s favorite excursions in Ireland is driving to Glendalough (pronounced “Glendalock”). It’s located in the Wicklow Mountains National Park, 90 minutes south of Dublin in County Wicklow. The name means “valley of the two lakes,” and it’s one of the most beautiful drives I’ve ever taken! Considering I lived in Chianti, Italy, for five years, that tells you a lot. Glendalough is also a great place to go on hikes. During our June 2017 trip there we clocked 8 miles in one day when we went, but it was all easy walking. We saw people of all ages on the trails. I’m hoping this guide will inspire you, my fellow travelers, to go! >>For another great place to drive and hike, try The Ring of Kerry. 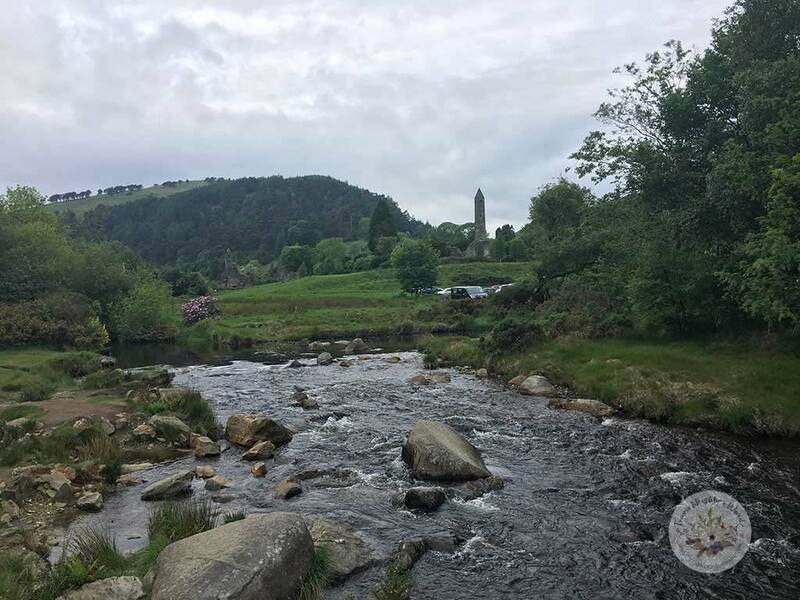 Driving to Glendalough means traveling on a seemingly endless expanse of gentle, rolling hills that reach far into the distance. We drove our Hertz rental car there from Enniskerry after our stay at the Powerscourt Hotel, which is also located in the park. On the way to Glendalough from Enniskerry, it’s easy to find places to park on the side of the road if you want to take photos. Or, you can chase sheep, which was my daughters’ preferred activity! If you’re up for driving there, I highly recommend that the person riding in the passenger seat shoot videos of the landscape as you go. We did and will always treasure them. Take the N11 towards Wexford. Take the R755 exit at Kilmacanogue. Follow signs to Glendalough through Roundwood and Laragh. A word of caution: The roads leading to Glendalough are twisty for very long stretches. Drivers who aren’t comfortable hugging the side of a drop-off may not like it. That said, it isn’t like driving along high cliffs. If you’ve driven the coast at Big Sur in California, it doesn’t feel steep in that way. I have some fear of heights and this road didn’t frighten me in the slightest. I think it’s because the hills gradually slope down and there are low stone walls lining the side of the roads. Regardless, you should plan your trip for daylight hours. I wouldn’t want to drive on these roads after dark since there are no street lights and facing high beams from approaching traffic would make it a stressful experience. The good news is that daylight a long time in Ireland during the summer! At the end of May it didn’t get dark out until 9:45 p.m. Before you make this drive, check when sunset will be. If driving isn’t your thing, there’s a bus service from Dublin called St. Kevin’s Bus Service. I haven’t taken it, but I’ve heard it’s been around since 1927. Buses depart daily from the Dublin Bus Terminus in Dawson Street. Round-trip tickets cost about 20 euros. There are different schedules for summer and winter, but you can get detailed info on their website. For a guided tour bus, plan on it being an all-day outing. Tickets tend to cost around 28 euros round-trip. The Glendalough Hotel is located on site. It includes a restaurant and pub. On Booking.com it has an 8.0 rating out of 10 (583 verified reviews). 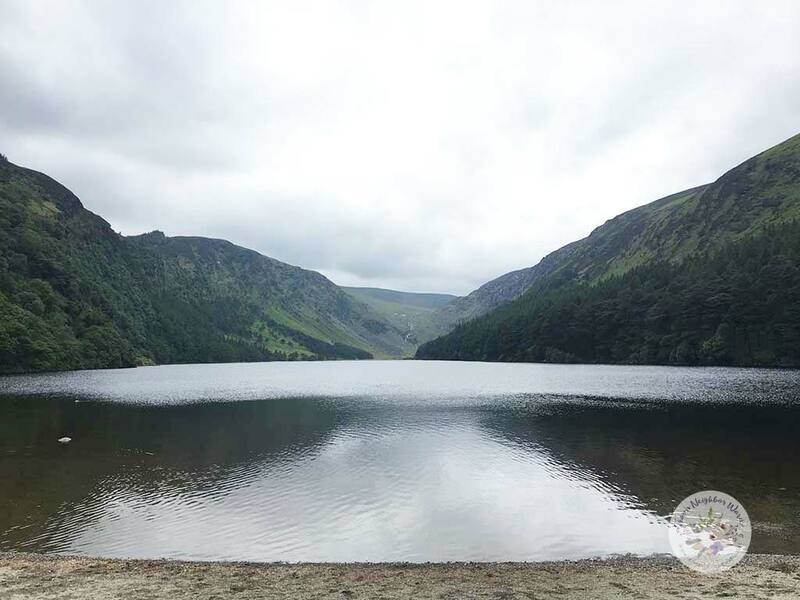 Glendalough includes a series of well-paved and dirt walking trails for hikers of all ages and levels. It also includes a series of significant architectural ruins. There are two lakes at Glendalough. They’re called the Lower Lake and the Upper Lake. When you first arrive, follow signs to the main parking lot, which is near the Lower Lake. There are guides there who will direct you to the right parking spots. Expect to pay around 5 euros in cash. Note: Try to arrive as early in the morning as possible. In summer the parking spaces fill up, particularly on Sundays. This is also where you’ll find the Visitor’s Center and The Glendalough Hotel. Note that you can park in another lot near the Upper Lake, but there aren’t any facilities there. After you park at the Lower Lake, you’ll walk through grass fields, past a building with bathrooms, and over a bridge. From the bridge you can get a distant view of the ruins of a monastery founded by St. Kevin in the 7th century AD. The ruins include churches and a round tower, which you can walk around; most were built in the 10th to 12th centuries. Although St. Kevin started it with a few followers, by the 9th century it was one of the leading monasteries in Ireland. In 1398 the English destroyed most of it. One of the things I love about Glendalough is the variety of trails. On one side of the lake there’s a wide, paved path filled with people of all ages strolling along. This path doesn’t require any real hiking skills. It’s a lot like paths you see at major parks. Those who want to see the lakes from above can hike on an unpaved trail that will take you to the top of the mountain over the course of a couple of hours. The lakefront path also leads you to the monastery ruins, which include the Priest’s House, which has been largely reconstructed from an 18th-century drawing of the original building. Other ruins you’ll find are a cathedral, St. Kevin’s Cross, St. Kevin’s Church, St. Mary’s Church, St. Kieran’s Church, and more. Aside from basic hiking gear (backpack and water), plan to picnic while you’re there. We brought a lightweight blanket and were glad to have it when we ate lunch by the lake, which was delightful. When you’re done walking around, you can buy soft-serve ice-cream and other treats in the information building near the parking lot. A great way to end a great day! 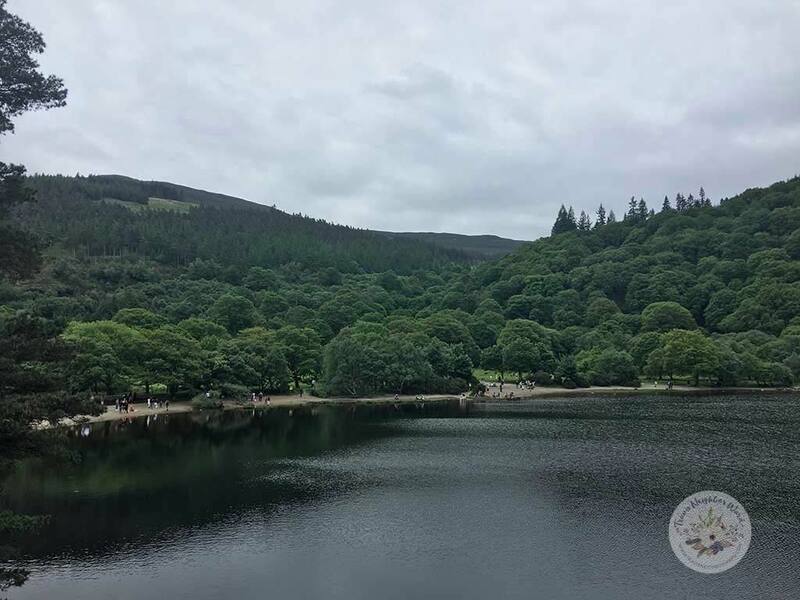 Got questions about Glendlaough or visiting Ireland? Leave them in the comments section below.